Known for his “enthusiastic performances” and a “Je ne sais quoi well beyond his years” (Oregon Arts Watch), Jason Sabino succeeded founding director Bernie Kuehn as the second Artistic Director of the Oregon Chorale. He is an active conductor, clinician and chorister in the Portland metro area. Outside the Chorale, Sabino is Artistic Assistant and Associate Conductor at Pacific Youth Choir, where he directs the Boychoir, PYC@Whitman outreach choir, and assists with the mixed high school ensembles Pacific and Chamber. He also directs the Chancel Choir at Southminster Presbyterian Church in Beaverton. Sabino prepares choruses for the Oregon Symphony regularly, most recently for their Star Trek Live and rePlay: Symphony of Heroes concerts. As a professional chorister, Sabino performs with Cappella Romana, Resonance Ensemble, Trinity Cathedral Chamber Singers, and is a recording singer with Oregon Catholic Press. He has sung under the batons of Helmuth Rilling, Carlos Kalmar and Carl St. Clair. Other highlights include singing back up for Barry Manilow and the Rolling Stones. 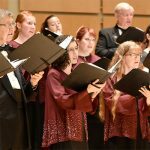 Sabino earned a Master’s Degree in Choral Conducting from Portland State University, where he was a graduate teaching assistant and adjunct faculty, directing several ensembles during his time there including the Chamber Choir, Man Choir, University Choir and Community Chorus. He received his undergraduate degree in Choral Music from the University of Southern California’s Thornton School of Music. Sabino studied conducting with Ethan Sperry, Jo-Michael Scheibe, Cristian Grases, and Donald Brinegar. He is also an active member of the American Choral Directors Association. Sabino lives with his wife Jenn, infant daughter Lilia, and dog Lilo in Beaverton. He loves video games, board games, watching sports, anime, eating and root beer.